The latest hypocritical open borders advocate to come back to the United States for safety is actor- renaissance man George Clooney.The liberal blowhard just moved his wife Amal and their newborn twins, Ella and Alexander, BACK to Los Angeles. Which last time I looked at a map is located in the United States of America……which he left because he disagrees with our border policy. Why would he move his family back into a country that he seemingly hates and disagrees with? It’s simple. 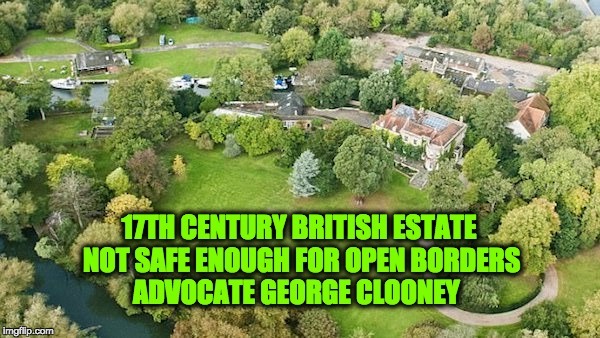 He may be critical of a border wall, but he is not against moving his family away from his England estate and back into America to protect them from terrorism (shhhhh-radical Islamic terrorism). The Oscar-winner realized that his 17th Century mansion wasn’t secure enough. So at 56-years-old, he tucked tail and ran back to his California mansion that features a — you guessed it — wall. Life & Style has exclusively learned that George Clooney has recently made plans to move back to LA, for the safety of his family, after the latest spate of terror attacks in England. George’s safety concerns had been growing for years. The Oscar winner “has been subject to very serious threats in the past,” reveals the source, because of his humanitarian efforts in Darfur, Sudan. And Amal’s work as an international human rights lawyer, along with her public pleas for foreign governments to prosecute terrorists, has made her a potential target. Perhaps now Clooney sees that the lover and tolerance that we should have for all immigrants without vetting them first, isn’t as simple as he preaches. Especially after seeing the many attacks in England over the last few weeks. I suppose it’s easy to throw bricks after safely getting back in his American home.